For over 28 years, Sushi Den has been regarded as one of the premiere sushi and Japanese restaurants in the United States. Located in the heart of Denver, CO, the restaurant delivers consistently excellent cuisine made from the finest ingredients from around the world. Master Chef Toshi Kizaki, the visionary behind Sushi Den, continually raises the bar and sets the standard for the restaurant’s high quality cuisine. The youngest brother, Koichi Kizaki, lives in southern Japan where he makes daily trips to the fish market to purchase the fish for the restaurant. The fish is then dry iced and reaches the restaurant within 24 hours. The company’s Den Farm in Brighton, CO, supplies fresh vegetables year round due to its technologically advanced greenhouse. Sushi Den’s mission is to maintain one of the nation’s top sushi restaurants through fresh ingredients, innovative, healthy dishes and exceptional service. Sushi Den offers both an upstairs dining room that can accomodate up to 28 guests and a private room with its own chef that can seat up to 8 guests. We offer a free valet service for your parking needs. There is also street parking available. We are located a few blocks southwest of the Louisiana/Pearl light rail station. Two pieces each of sliced maguro (tuna), hamachi (yellowtail) and shake (salmon) beautifully arranged with shredded daikon radish and shiso mint. Two kobe beef skewers served atop whipped potatoes, with a port wine reduction. Sweet korean marinade, jalapenos, sesame seeds, mushroom, haricot verts. Thinly sliced ny strip steak and shirataki salad served with a ponzu sauce, served raw. Tender calamari, asparagus and mushrooms sautéed in a sake garlic butter sauce. Japanese eggplant and julienne bell peppers sautéed in honey sesame miso glaze. Mesquite grilled chicken and vegetable skewers, glazed with house teriyaki sauce. Sauteed chicken in shichimi pepper sauce. Pan-seared dumplings filled with pork and cabbage, served with spicy sesame oil vinaigrette. Crispy eggrolls filled with savory pork and vegetables. Served with spicy yellow mustard. Mesquite grilled shake (salmon) or hamachi (yellowtail) collar seasoned with sea salt. Served with your choice of ponzu, lemon-garlic or teriyaki sauce. Seasonal sweet pea soup enhanced by a touch of cream and hints of spice. Garnished with micro greens and a sesame cheese-stick twist. Traditional japanese miso soup with tofu, seaweed, green onions, enoki, shimeji, and shiitake mushrooms. Light bonito broth with japanese fish cakes, mitsuba (wild japanese cilantro) and enoki mushrooms. Mesculin greens, cherry tomatoes, radish and japanese cucumber drizzled with the house ginger-tofu dressing. Sautéed strips of white and dark meat complimented with romaine lettuce, beets, feta cheese, tomatoes, and a coconut peanut butter sauce. Yellow and red beets tossed in a red wine vinaigrette and topped with herb crusted goat cheese. Grilled shiitake mushrooms served with mesclun greens, asparagus and pink grapefruit and grape tomatoes tossed in a soy-ginger balsamic vinaigrette. Seared tataki served with mesculin greens, asparagus and pink grapefruit tossed in a ponzu vinaigrette. Roasted duck breast served abed mesculin greens, daikon radish, asparagus, carrots and pink grapefruit tossed in a soy-ginger balsamic vinaigrette. Traditional caesar with a choice of seared tuna, fried calamari or shrimp tempura. Tuna, yellowtail, salmon, white fish, shrimp, scallop nigiri, and choice of tuna roll (6 pc) or california roll (5pc). 2 pc. Each of tuna, yellowtail, salmon, white fish and octopus. California roll (5 pc), poki roll (8 pc) and a scallop hand roll (regular or spicy). Served with mixed greens and plum potato salad. Served over creamy risotto with a sauté of wild mushrooms, peas and pea tendrils and a carrot-ginger gastrique. Your choice of california roll or tuna roll. with Your Choice of: Beef, salmon, or calamari steak. Sushi Den serves some of the best raw fish in Denver. Always a “go to” when in Denver and never disappoints. Items off the chefs menu were the highlights. Superior. Every thing is done well in a James Beard award winning restaurant kind of way. Food was decent, service mediocre. Not really an authentic Japanese taste, but if you like American Japanese food and American sushi, this will be a good place for you (I travel to Japan several times a year). Service was mediocre at best, even though the server said it was a "typical" Saturday night and was used to this level of busy. In my opinion, this restaurant is highly overrated. There are better places for sushi in Denver. It’s the best sushi and Japanese restaurant in entire country. I have been going there for almost 30 years. Amazing sake and sushi date night! The seared scallops were delicious and the firecracker roll was so good with the fresh jalapeño on top. The Den never disappoints and is still my favorite sushi restaurant in Denver! Second time here, Food was amazing, service on point... well worth the price. Incredible sushi. One of the best I’ve been to in the country. Thank you for the fresh cuts and the great service! Our lunch at Sushi Den was slightly above average. It was loud and cramped inside the restaurant. The food was very good, but the service was scattered and we never received all the sushi we ordered. It's also disappointing that the restaurant chose not to provide any OpenTable points for the reservation. Sushi Den is consistently one of my favorite SUSHI restaurants in Colorado. Awesome fish done in a traditional way with a decent selection of saki. Best banana cream pie I've ever had. We always enjoy the Sushi Den. The valet parking attendants are friendly and helpful, the food is fantastic, and the wait staff is well trained and usually pretty good at handling the noise and confusion. Downside: although this place has many tables, it is so popular that unless you are in line when the doors open you will wait a long time for a table. Once seated customers want to stay and stay. No good place to wait either. Still, dining here is a fabulous experience. Sushi Den is never a disappointment. The food is good, they have a wide range of drinks and the service is usually very professional, though not overly friendly. The garlic calamari is especially good! Very poor service this last trip which was super disappointing. Was for a bday and only after they took my cake to the back did they inform me of the cutting fee. Cake took almost 20mjn after the meal to arrive and find out and they threw away the boxes I brought so we had to wait even longer for a alternative box. We didn’t even cut the cake or eat it since it took so long yet they still charged me $7.50...for what idk. Phillipe was the best! We celebrated my Father in Laws Birthday here and the entire experience was fantastic. The wine a Chenin Blanc from South Africa, the sake, the seared Sushi offerings, the rolls, beautiful fresh fish. A million thank yous Sushi Den! The settings are very nice and the food is delicious, though on the expensive side. We had reservations for a birthday celebration for eleven people ranging from 9 months to 88 years old on a recent Sunday in the early evening. We appreciated the valet parking in arrival. Once seated, our waiter proved to be very knowledgeable & skilled, answering all our questions & making some very good suggestions. The Sushi & other food was delicious! We were allowed to bring in a bakery birthday cake which our waiter presented to the birthday guest lit with candles for singing. He then took it back to the kitchen & served each of us sliced cake. We had a festive, delicious, memorable birthday dinner party at Sushi Den in Denver and plan to return for other happy occasions. Had a nice time at Sushi Den. The only complaint is that our table was WAY TOO SMALL. We requested another table that could properly accommodate our party of four, but the server plainly said "no" despite a larger table set for four near us being open. We simply had no room to dine comfortably. We asked the server to take the soy sauce container so we could have more space (that's how cramped we were!) but he said "no, that stays on the table". OKAY THEN. Nice meal to share over business. We had a reservation and were seated promptly upon arrival. The variety of sushi is great and the taste is amazing. Everything was so fresh and delicious. Our table was not ready when promised. Then we were seated in a very noisy bar area. We were very disappointed because we had out of town guests with us. The food was delicious and our wait staff was very efficient but the whole experience was not up to what we have experienced at this restaurant in the past. Yum! Loved it! Can’t wait to go back! We had a pregnant server last night and she was super nice. The wagyu steak was incredible as well as the rolls! 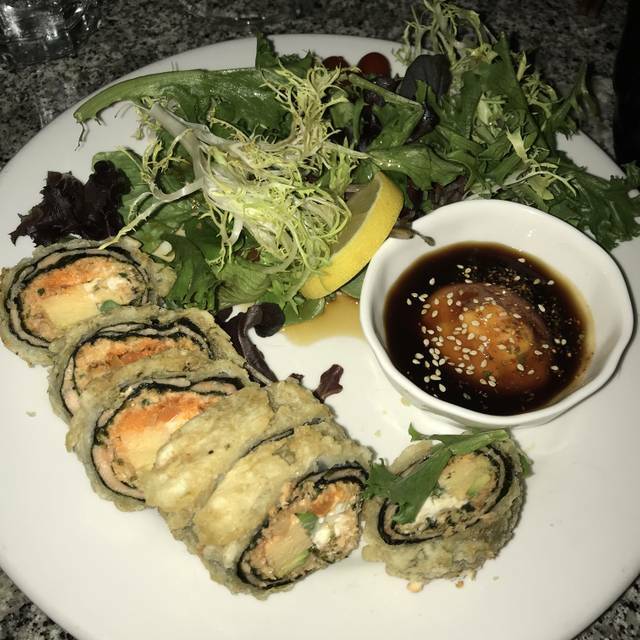 For those that enjoy Sushi - there is only Sushi Den - you always have a wonderful meal! The sushi is the best I’ve had. So good!! RSVP table 2 weeks ahead. Check in on time but have to wait for 15 minutes to get the seats! Sushi Den never disappoints. Fish is always fresh. Rocio, our server, was very friendly and knowledgeable. I can't wait to back again. So fresh and delicious. Even beyond high expectations . Hope they never compromise quality. One of my favorite restaurants in the United States. Whenever I’m in Denver or even just passing through on my way to the mountains, I always stop in for a meal. Love the calamari with mushrooms, but the snapper sushi was not up to par on my recent visit . I haven’t come back to sushi den after a long time. I love how I got reservations and I got in right away when I’m arrived. But I was disappointing at I had my mom birthday and the servers didn’t bought any out, he forgot hot towel as he was offering at first, and forgot one of my order I don’t know it might from the kitchen. Absolutely perfect in every way. Stellar service, amazing food, perfect setting. The very best! Critically acclaimed by all who have had the opportunity to dine at Sushi Den. No better Sushi in the United States of America. Everything about Sushi Den is world class! All you have to do to order an outstanding meal is close your eyes and point at the menu. Waitstaff excellent at advising novice diners. MY FAVORITE! Especially Carlos and Amie! Thank you for always being fabulous! Best sushi in Denver and always pretty consistent.